The topic I want to focus on today is a very important one because it is a 'guaranteed' swing killer and, unfortunately, is one of the most common problems in most amateur golfers. The problem is an unstable spine angle. I call it the 'guaranteed' swing killer because it is virtually impossible to make solid, consistent ball contact when your axis of rotation (your spine) is moving while you are rotating through your full swing motion. If you have been evaluated by your golf coach to have an unstable spine angle, it stems more from your physical/structural imbalances than from your simple lack of understanding about what a stable spine angle looks and feels like during the full swing. Until the ‘physical’ cause of your unstable spine angle is fully identified and fixed you will continue to make full speed swings with an unstable spine angle – regardless of what you try to consciously think about to stabilize your spine. Your body ‘structure’ governs your body ‘function’… not what you understand about the golf swing and what you are thinking when you make full swings. Therefore, until you are also evaluated by a golf-specific physical conditioning expert to identify what specific physical imbalances you have and what custom exercises you will need to improve your individual combination of posture, balance, flexibility, strength, stability, body control and endurance issues. Getting your body 'golf fit' will be relatively more valuable to you than simply taking more golf lessons or spending extra hours of hitting balls on the range. Getting the proper, customized and golf-specific physical conditioning exercises that fully integrate with your professional golf instruction and swing re-education drills will be what ultimately corrects your real spine angle problem. Clearly, if you are not taking lessons, you probably won’t know if your spine angle is stable or not. So getting the evaluation from a qualified golf pro is essential! Because, if your spine angle changes, particularly during your transition from the top of you backswing to impact, your ability to make a solid ball contact with optimal ball compression and swing speed will be a limited. 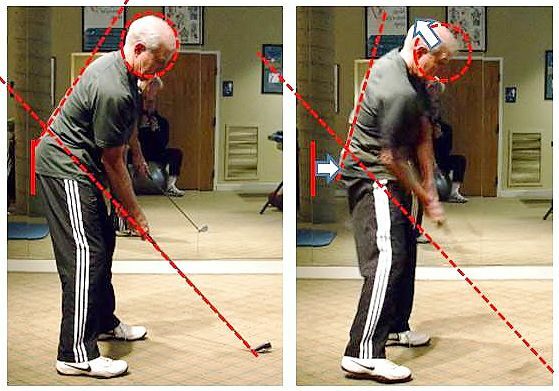 The most common problem observed in golfers with unstable spine angles is early hip extension… forward thrusting of the golfer’s hips/pelvis toward the golf ball while tilting the upper torso back away from the ball in the downswing (see pictures above). Forward thrusting of the hips and backward tilting of the spine in the downswing is essentially losing the proper, stable spine angle established at address. The consequences include a massive loss of power and poor consistency through the hitting zone. When you develop the physical ability to maintain a stable spine angle you will finally experience far better results. You will be able to rotate your body around a stable spine (axis of rotation) completely through the hitting zone for more consistent, solid ball contact, greater swing speed, power and accuracy. 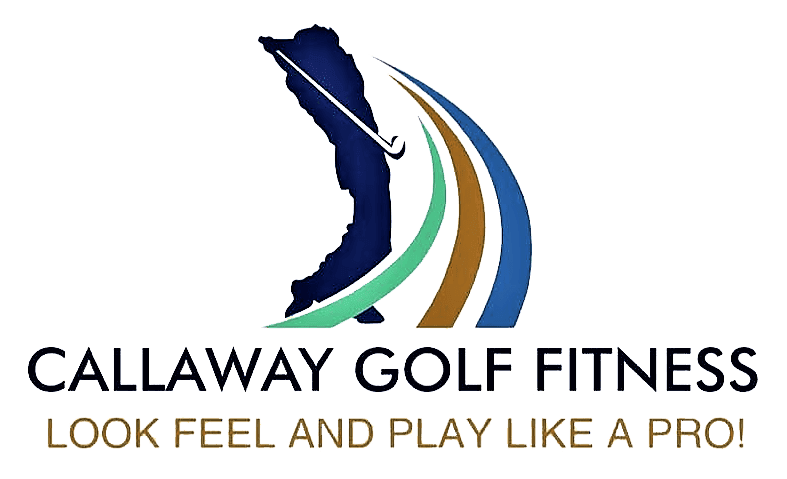 The best way to correct the physical strength imbalances in your body that are contributing to your unstable spine during full speed golf swings is to schedule a comprehensive golf-specific physical performance evaluation with a golf fitness expert. Only after you know for certain what ‘your’ individual needs are will you be able to select and perform the proper exercises to most efficiently and effectively re-balance your body and begin to make full swings with a stable spine angle. However, here are two terrific exercises that I often give to my golf fitness clients after their evaluations to help stabilize their spine angles. Click on the links below to watch the exercise videos. Loss of spine angles through the full speed swing is a common swing flaw for many amateur golfers. The early hip extension, decreased rotation and power leakages are the most typical consequences of an unstable spine angle. If you are struggling with distance and consistency, I would schedule a golf-specific physical evaluation right away and follow the prescribed exercises that will help you most quickly condition your body and most efficiently stabilize your spine. Your body structure controls your body function! Simply correct the physical cause to stop this most common 'guaranteed' swing killer once and for all!